Takeaway: For plants to take up nutrients, the nutrient must be in the form of ionic salt. But organic and synthetic nutrients feed plants at a much different rate. Frank Rauscher guides us through the complex world of nutrient salts to get the most out of our crops. Isn’t salt a bad thing for plants? As gardeners and growers, we are keenly aware of the damage that can be caused by excessively salty soil or water. However, guess how long could a plant live without any salt. The answer is not very long. A plant can only absorb a nutrient when that nutrient is in the form of an ionic salt. This is because a membrane potential (positive versus negative) needs to exist to provide the energy to move the nutrient into the cellular cytoplasm. So, properly administering nutrients is necessary for healthy plant growth. Knowing how these are balanced will go a long way in maintaining a healthy crop. 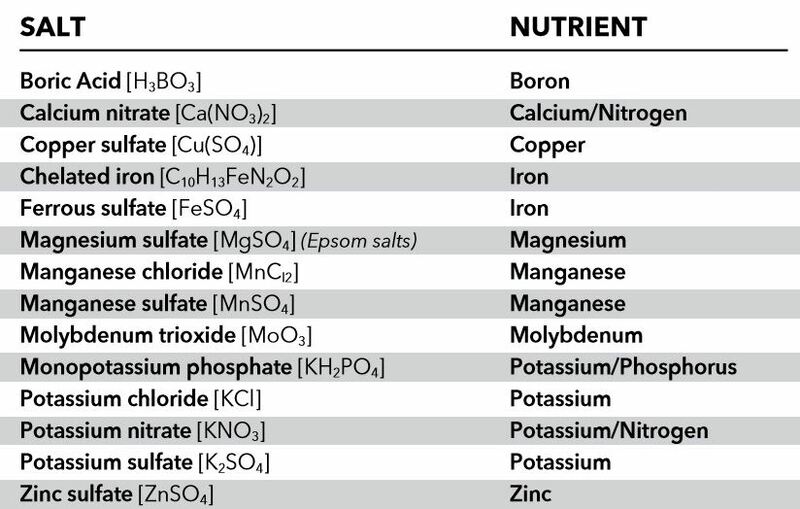 (See below for a few examples of salts used for plant nutrition). Let’s look at an organic nutrient; we’ll use nitrogen as an example. Plants need nitrogen to produce foliage growth (among other things), yet root systems are not able to take up nitrogen directly. In chicken manure, about 80 per cent of the nitrogen content is organic and must be mineralized or converted to ammonium or nitrate to be available for plant uptake. For some forms of nutrients, it often takes up to a year for this process to occur. It requires time, temperature, and bacteria to make the conversion. This is the main reason why applications of organic nutrients do not overfeed or burn a plant. The nutrient is simply not in a form that the roots absorb. It is after this conversion process that the nutrient becomes a salt and so becomes available for uptake. What are the Benefits of Organic Nutrients? Most of the nutrients found in organic fertilizers are not yet in a salt form, so the plant can’t take them up. So, is there a benefit to this? Yes. Let’s look at nitrogen again. There are different processes for converting nitrogen sources into ionic salt form, and these coincide with basic fertilizer types. The first of these processes is hydrolysis, where nitrogen is converted by water. The second is mineralization, where soil microbial action converts the nitrogen source. Temperature completes the mineralization process. The processes or reactions that need to occur for nitrogen to become plant-available is rather complex. During the mineralization of an organic nitrogen, bacteria, in concert with protozoa, go to work consuming the nitrogen and converting it into nitrates, ammonium, and other byproducts. These nitrates are immediately available to the plant. This process takes time and increased temperature and goes slowly so the availability of nitrates is gradual and safe. After nitrogen, phosphorus also requires the same kinds of reactions to become a salt and therefore available for plant uptake. Plants mostly absorb phosphorus as the negatively charged primary and secondary orthophosphate ions. Some prepared nutrients may have these already within the fertilizer compound while organic forms require mineralization processes to occur first. This again makes for a slower release of the nutrient. During nitrogen transformation, bacteria in the soil, such as nitrobacter, along with a multitude of other bacteria and protozoa, are being continuously fed. As a result, the microbes multiply and create a living soil. The concentration of microbes in living soil can be awesome. One teaspoon of living soil may contain 100 million, and even up to a billion, bacteria. Up to 40 miles of fungal filaments, or hyphae, may also be present in that small sample. Living soil is a primary basis for creating plant vigor and health to helps growers obtain maximum yield from their crop. These microbes hold water in their cells that can be available for the plant later. The bacteria eat plant exudates like sugars and carbohydrates and applied organic nutrients. Protozoa then excrete plant-available nutrients. Beneficial fungi protect the plant roots from pathogens and harmful microbes while forming a symbiotic relationship with the roots for enhanced nutrient uptake. Mycorrhizal fungi are an example of this. If you have used a soil permeated with this beneficial fungus, you are already aware of just how much extra plant vigor, foliage, flower, and fruit you were able to obtain. In every case, the mineralization process builds soil life and health. The number of benefits from living soil is overwhelming, and this in turn is the reason so many gardeners prefer to use organic nutrients. Under “nitrogen” on your fertilizer label, you will see what per cent of the product is nitrate, ammoniacal nitrogen, urea, or water soluble and water insoluble. Because so many fertilizers use at least some, if not a large amount, of urea, it is useful to discuss this feature. Like organic forms of nitrogen, the release mechanism for urea is mineralization. Urea typically takes up to a month to become available to plants; however, there are several different types of urea and each has considerably different release times. Cold water-soluble urea becomes plant-available within a couple of weeks, while hot water-soluble becomes available in two to three months, depending on soil temperature. Water insoluble urea can take up to several years to be released. Because these nutrients can become available at such a varying rate, you can see why it could be difficult to know if your crop is being over-fertilized. Care needs to be taken and periodic soil testing can help to know whether additional nutrient is needed. Also, it’s best to read the label to become aware of the assimilation characteristics of plant nutrient. There are circumstances, however, where adding ready-to-uptake nutrients to an organic nutrient base can have its advantages. In cases where a plant shows signs of insufficient nutrition, organic nutrient sources may be too slow to correct this deficiency in time to prevent a reduction in various desired crop characteristics. Adding the right amount of inorganic nutrient to the soil, or even perhaps a foliar application, can be the solution. With many synthetic fertilizers, the nutrients they contain can be immediately taken up by the root system, or at least they will become available very quickly. For example, the nitrate form of nitrogen often provided in synthetic fertilizers is immediately available (making it easy to over-fertilize a plant). While inorganic nutrients do not sterilize the soil itself, they do not feed soil microbes. These microbes will still reproduce and do their good work provided organic nutrients are present, though. It is only when the grower is relying solely on inorganic nutrients that the soil will gradually become sterile via starvation of the microbes. Knowing the right amount and the right reason for adding inorganic nutrient is the key to success. During certain phases of growth, a spurt of extra phosphorus or nitrogen can create various desired effects. Micronutrients, those that can add to flavor, may also be needed at a specific time during the growth cycle. In the end, remember that using organic forms of nutrients is going to build your soil while you feed you plants. This should be a top priority. However, try keeping an open mind about using synthetic nutrient salts in situations where they can benefit your crop. Why not get the best of both worlds? Can You Remove Salt from Sea Water and Give it to Your Plants?